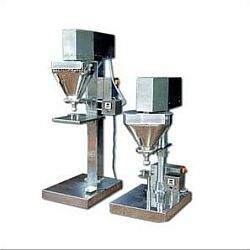 We offer powder filler machine which are reliable and give consistent output. They perform volumetric weighing and dozing of the powder and granules in containers and pouches. These Powder Filler Machine are well-equipped with adjustable volumetric Disc. They find their application for packaging Detergent, Powder, Tea, Namkeen, Rice, Pulses and other materials.